Berenice Verhelst studied classics and obtained her doctorate in 2014 (University of Ghent, Belgium) with a dissertation on Nonnus’ Dionysiaca, focussing on the narrative function of speech and the influence of the rhetorical tradition. Currently, she holds a post-doctoral fellowship of the Research Foundation Flanders (FWO). The title of her research project “Reinventing epic poetry. Creativity and tradition in late antique epyllia” reflects her main research interests, namely late antique poetry and the epic tradition at large. Her approach is informed by narratological theory and genre studies. 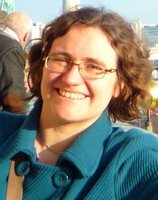 Berenice Verhelst is currently involved in several international research projects: She contributed to the Brill’s Companion to Nonnus (in press, to appear in April 2016, ed. D. Accorinti), is part of the team of translators working on the new English translation of Nonnus’ Dionysiaca (University of California Press, PI: Tim Whitmarsh) and coordinates (together with Tine Scheijnen) a collaborative book project (“Walking the Wire. Greek and Latin Late Antique Poetry in Dialogue”). She has also published on Nonnus (several articles) and Musaeus (a Dutch translation with introduction).